Representatives for GOP Sen. Lisa Murkowski are demanding that her fellow Alaskan, Democratic Sen. Mark Begich, take down a campaign ad featuring her image — an unusual instance of two sitting senators from the same state in a public spat. In a letter disseminated on Thursday, the law firm for Murkowski’s Senate committee skewered a Begich ad in a cease-and-desist missive. The ad in question, “Great Team,” features Murkowski and Begich appearing together, along with testimony from an individual who says he is a lifelong Republican, a Murkowski voter —and also a Begich supporter. The letter charges that Murkowski’s image was used misleadingly and without her permission, and that the individual in the ad is not a lifelong GOP supporter but is in fact undeclared. The photo in question, however, appears to be hosted by the Associated Press. 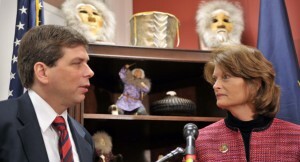 Begich, running in deep-red Alaska, has sought on several occasions to highlight shared positions with Murkowski. But she is distancing herself. Alaska’s GOP primary, which will determine Begich’s Republican opponent, is on Aug. 19.